Members and supporters of the Satanic Temple wheeled a statue of winged, goat-headed creature Baphomet onto the grounds of the Arkansas state capitol on Thursday to horn in on a battle over religious freedom. The Baphomet rally protested a Ten Commandments monument installed last year outside the state capitol after lawmakers approved it in 2015. In May, the American Civil Liberties Union sued on behalf of four Arkansas women to remove the monument, saying it violates the First Amendment's guarantee of religious liberty for all. Lucien Greaves, spokesman and co-founder of the Satanic Temple, characterized the event as a rally for "all people who hold sacred the founding Constitutional principles of religious freedom and free expression" in a statement to HuffPost. "What we are asking for is only that the public square ... remain an area where free speech, religious liberty and equality under the law be respected by the holders of public office who swore to uphold those values," Greaves told a crowd at the rally on Thursday. At a counterprotest a day prior to the rally, opponents of the Satanic Temple held signs bearing phrases like "Blasphemy is not free speech," "Satan has NO rights," and "Honk for Jesus." Meanwhile, Arkansas Republican and state Sen. Jason Rapert, a minister and lead sponsor of the law allowing the Ten Commandments monument, called the Satanic Temple rallygoers "outside extremists" and "pranksters" who "promote the profane." It will be a "very cold day in hell" before a statue of Baphomet will be installed in Little Rock, Rapert said in a videotaped statement. 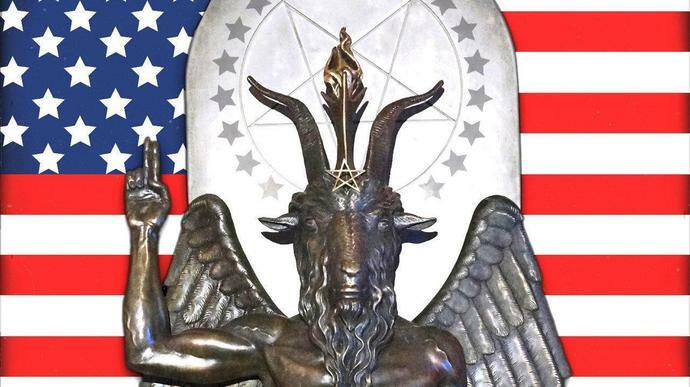 Despite the Baphomet statue, members of the Satanic Temple, which is headquartered in Salem, Massachusetts, don't worship any deity. They consider themselves "compassionate" humanists who believe in science. The Satanic Temple's mission is to "encourage benevolence and empathy among all people, reject tyrannical authority [and] advocate practical common sense and justice," according to its website. Satanic Temple members have been involved in others protests for religious freedom. Because evangelical Christians won a Supreme Court decision allowing them to teach classes on public school grounds, the Satanic Temple launched its own (forked) tongue-in-cheek "After School Satan Club" featuring "rationality" and "fun." The Satanic Temple has also challenged abortion laws in Ohio and Missouri, arguing that they were founded on religious dogma that violates its members' beliefs. Last week, a federal district judge in Arizona denied the city of Scottsdale's motion to dismiss a lawsuit from the group for denying its members the opportunity to give an invocation at a city council meeting. The case will now go forward. The Satanic Temple had a recent struggle with its branch in Portland, Oregon, which announced on Wednesday that it's ending its affiliation with the group. The branch reportedly took issue with the temple's hiring of attorney Marc Randazza to represent it in its religious discrimination lawsuit against Twitter, according to Vox. Randazza previously represented right-wing conspiracy theorist Alex Jones. The leader of an armed group that is stopping undocumented migrants crossing into the United States from Mexico is expected in court on Monday as federal prosecutors crack down on civilians attempting to enforce immigration policy. The FBI on Saturday arrested Larry Hopkins, leader of the United Constitutional Patriots group, whose camouflage-wearing armed members claim to have helped U.S. officials detain some 5,600 migrants in the last two months. The group claims to be working in support of President Donald Trump's crackdown on immigration.